There are several commanders that have been labelled as group hug generals, and Selvala is one of them. She ended up being the one I chose because I not only enjoy her ability but I also see the potential for combos using her. She’s also an Elf, so an Elf tribal subtheme is present as well. 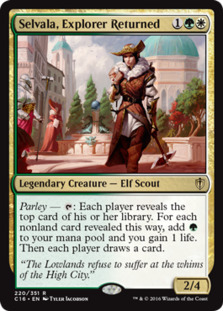 Her ability, Parley means that each time I tap her, everyone reveals the top card of their library, gets to draw a card as well, and I get green mana and life for each nonland card revealed. So clearly, I benefit the most, but I’m giving card draw to everyone and for that they will likely leave me alone for a while. This will give us time to establish our board state. Since we’re building Selvala in a Group Hug fashion, I wanted to make sure to include some cards that not only benefit me, but benefit others. There are many throughout Magic’s history but some of these cards I’d never play under other circumstances. Howling Mine and Horn of Greed are one thing, they just provide extra card draw for everyone and I can live with that. Cards like Hunted Wumpus or Iwamori of the Open Fist are harder to swallow — these allow people to play cards for free from their hand when I cast them. Granted, I am getting large creatures for a low mana cost but I’m also benefiting the rest of the board and don’t look forward to seeing someone get an Emrakul for free if you know what I mean. Other cards allow me and opponents to get creature tokens, or ramp a bit, etc. These cards aren’t here to win me the game, they are here to help keep people off of my back since I’m helping them out so much so that I can develop my gameplan. To win with this particular group hug deck, there are a number of combos and other ways, which I’ll go over now. So, with any of the above Elves, and a minimum of 3 other mana dorks on the board, you can equip either Sword of the Paruns or Umbral Mantle to one of the big mana elves and essentially tap and untap at will to make infinite mana. This combo is a little more convoluted, but still will produce infinite mana. You need an Elf that produces 3+ mana like the Archdruid here (and having enough Elves out at the time), which you will tap, then use Mirror Entity’s ability to turn your Wirewood Symbiote into an Elf. Return it to your hand with its ability (as it is now an Elf) to untap your Archdruid, which you can then tap to cast the Symbiote and rinse/repeat. So you can make infinite mana, but what are you going to use it for? And also, what if you can’t get all the pieces together quick enough for it to matter? I’ve included other win-cons in the deck as well, so let’s take a look at those. With infinite mana, we can win a game outright by throwing a bunch of mana into a Hurricane or Squall Line, though you will have to have more life than all of your opponents to do so. Via combat, we can use Beastmaster Ascension, Triumph of the Hordes and Ezuri’s ability to beef up our forces and do tons of damage. Alternatively, since we are gaining life often, we might flash in a Felidar Sovereign the turn before ours so that during our upkeep we win the game with a life total of 40 or more (more on how to flash him in later). Lastly, if we have a bunch of mana dorks out, we don’t really need land to cast spells, so a well timed Armageddon will wipe out everyone’s ability to respond to what we’re doing. Worst case scenario, if we can make a ton of mana we might be able to make an army of 4/4 Angels to do our dirty work with Luminarch Ascension. These cards are the utility backbone of the deck. Giving all of my creatures haste is great for speeding up ramp, and there are some more untapping shenanigans as well. I added Mirri, Weatherlight Duelist because I actually wanted to build a deck around her, but find that she’s a good pillowfort tool in these colors. I’m sure I can find a way to keep her tapped and protect myself. Lastly, being able to flash in cards like Felidar Sovereign is important so I’ve added the Veldaken Orrery. This deck looks to be fun and unassuming but can theoretically pack a punch. Selvala is a Tier 2 general, so I think I should be able to find some consistency with her. I will report back once I’ve tested this one out!